Home Duterte Events Executive Government News President Traslacion President Duterte message for TRASLACION 2017. 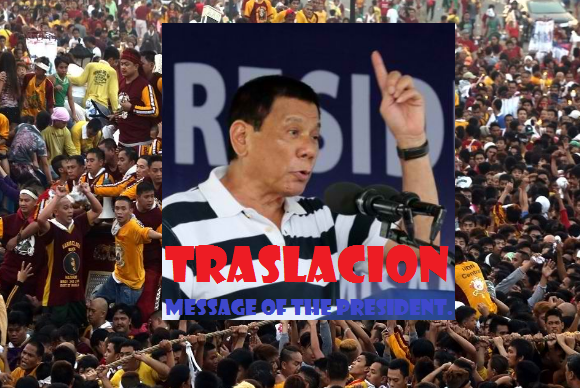 President Duterte message for TRASLACION 2017. The Feast of the Black Nazarene and the message of the President Duterte. Good fortunes are usually borne out of hard work and perseverance. Prayers are likely answered because we do not give up or get tired from asking God for the fulfillment of our heart's desires. Such is the phenomenal expression of faith of the millions of devotees in the form of gratitude, petition, and sacrifice shown in the image of the Black Nazarene every feast day on the 9th of January every year. We are neither exhausted by praying constantly nor do we ever falter in expressing our religious fervor. Despite the passage of time, we relentlessly fight against injustice and lies; abuse of power; and the corruption that eats up the soul. My administration has deep empathy for the core of faith that pushes the masses of Filipinos to resort to sacrifice every single day, while still finding a piece of themselves to honor God—whose image we recognize in the man of Nazarene, who carried his cross to redeem the rest of humankind. In His tears, we see our sorrow; and in His agony, we find our solace and strength to triumph against the most insurmountable odds. Through our fervent prayers for the country, let us join the Catholic faithful in the passionate observance of the Feast of the Black Nazarene.